Lakshmi, Saraswathi, Yesu Kumari, Manjula and Parvathi -- five girls who hail from rural Andhra and work as tele-callers in Hyderabad -- have similar stories to share. The story of a bleak beginning, difficult childhood and uncertain future; of traversing the long path towards becoming confident, financially independent young women. For all of them have one more thing in common: they are disabled. Government data claims that there are two crore (20 million) disabled people in the country. But the harsh reality, according to those who work with the disabled, is that there are nearly seven crore (70 million) disabled people in India. The statistics available unofficially are even more disturbing. Seventy percent of India's disabled population live in rural India. Only two per cent of disabled Indians is educated and only one percent is employed. The five girls belong to that marginal one per cent. 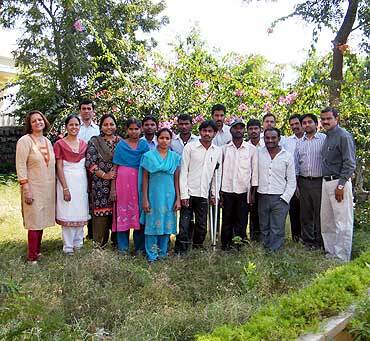 And that is thanks to their determination and their training at the Centre for People with Disability Livelihoods. The CPDL is a unique initiative envisaged by the Wadhwani Foundation, in partnership with the Society for Elimination of Rural Poverty of the Andhra Pradesh government. 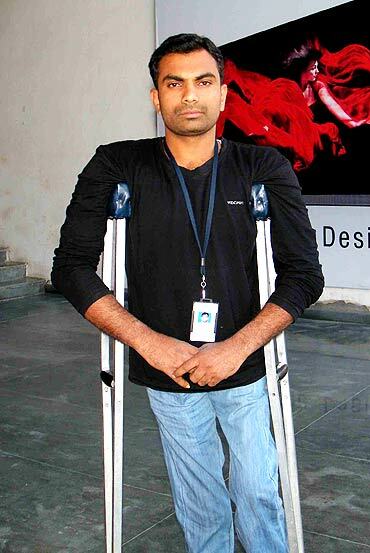 The Wadhwani Foundation had sought to ensure quality jobs for one lakh people with disability (PWD). With the right kind of training, believed the foundation, PWD youth could be incorporated into the mainstream job market. The foundation has also forged a memorandum of understanding with the American Indian Foundation and Dr Reddy's Foundation, which helps the centre train the PWD. Meera Shenoy, executive director of CPDL, was earlier involved with the Jobs Mission project spearheaded by the AP government, which aimed at providing job-oriented training to rural and tribal youth. 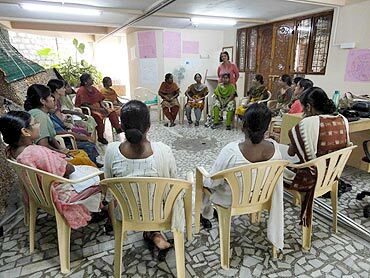 When she moved on to CPDL, Shenoy decided to involve the private sector in the training process. So, these PWD are trained according to the requirements of the concerned sector. The public-private partnership initiative started by the foundation along with the AP government provides, according to Shenoy, a template for any state government to work on. The CPDL, which started functioning in August 2010, has an in-house training centre where they innovate and provide training as required by various companies. Currently, the CPDL has 20 companies as their partners and they have already trained three batches of PWD. As many as 70-80 per cent of these PWD trainees has already been placed in BPOs, tele-calling centres and the retail sector. By March 2011, the CPDL aims to team up with 100 companies. 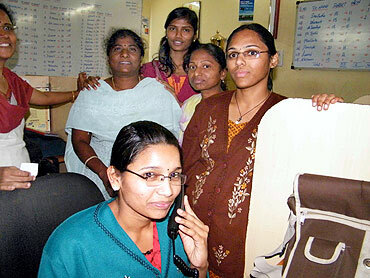 In their third batch, the CPDL trained 17 girls from rural Andhra. "When they came here, they were depressed. They didn't smile and above all, they had no hope. We had to build their self esteem bit by bit," recalls Shenoy. But only two months of training at the CPDL changed their attitude completely. These girls were ready to face any interview board, and all 17 were selected by various private companies. Saraswathi, who lost both her legs to polio, is an example of how the CPDL has effectively touched these girls' lives. Though she had completed her graduation and a computer training course, she could not get a job due to her disability. But after her training at CPDL, HDFS, the financial arm of HDFC, employed Saraswathi as a tele-calling officer with a handsome annual salary. Today, she dreams of providing "a good life to my family and medical treatment to my younger brother and sister (they suffer from congenital heart problems.)" Manjula, 20, talks about the time she moved to Hyderabad and stayed in a hostel for the disabled. She had a tough time as she had to take the bus to the polytechnic college where she studied electronics. "My desire is to start a service centre for mobile phones. One day, I will start my own centre. Thanks to the training I had at CPDL, I got a job here at the tele-calling centre 15 days ago, and I get a salary of Rs 3,500 every month. When I get my first salary, I will give the entire salary to my mother," she says. She adds with a smile, "I have one more dream and that is to be the team leader. I am sure one day, I will." 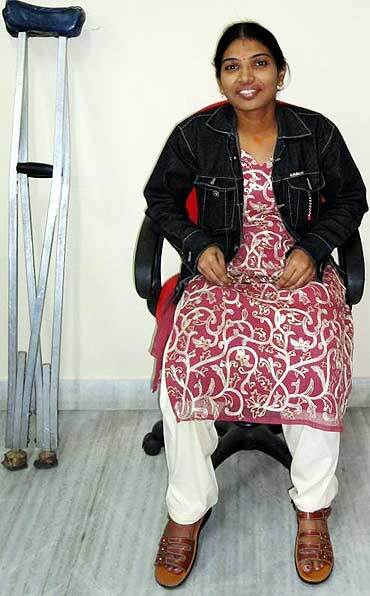 Lakshmi, 23, had to drop out of college because of her disability. "I used to travel to school on a tricycle but I couldn't go to college as it was 15 km away. The happiest day in my life was when I got this job after my training at CPDL. I felt proud of myself; I am a working woman and I am confident. In the last 15 days, I got three deals," she says proudly. Parvathi, another CPDL trainee, has managed to seal 15 deals in 15 days at the tele-centre! The centre had not only imparted training to these girls, it has also given them the strength to chase their own dreams. Says Yesu Kumari, "I never expected to be an economically independent woman. My life was so dark that I could not even dream then. Despite trying hard, I could not get a job. After my training at CPDL, I got this job and I have no words to express my happiness. I do not want to be a burden on anyone; I want to stand on my own legs though they are weak." Yasoda, who trained the physically disabled girls, said the motivation levels of these girls were surprisingly high. "They were willing to work harder and were all ears during the lessons. As far as their abilities are concerned, they are equal to or better than the others. The result is there for all to see. Parvathi cracked 15 deals in 15 days. The others also got good deals. All of them are remarkable." Mohammed Rafiuddin is another success story spawned by CPDL. The son of a poor agricultural labourer, Rafiuddin works as a Hindi instructor for new recruits at a tele-calling centre. Once ridiculed and teased for not being able to walk by his classmates, today he travels to his office by himself and stands confidently with the help of callipers. A former trainee of CPDL, Rafiuddin didn't let disability or poverty dampen his spirit and taught in a local school part time to fund his studies. CPDL has devised special programmes for illiterate PWD, as many of them don't have access to any education. The centre has teamed up with some corporate houses, like Geetanjali Gems and Jewellery and Kentuky Fried Chicken, who provide jobs to such trainees. CPDL explains to these corporate firms that they should not consider giving jobs to the disabled as part of their corporate social responsibility. "We tell them they make good workers, but they have not tested PWD before. We tell them to test them first with at least two people, but we have seen that they come back to recruit more," informs Shenoy. The CPDL has also managed to convince the state commissioner of rural development to employ disabled people to run the computer operations for the National Rural Employment Guarantee Scheme. As many as 22 PWD have already been recruited in the NREGA. But Shenoy doesn't mince her words while speaking about Indian society's attitude towards the disabled. "It's a very cruel society. For example, when we wanted to take a house on rent as our office, nobody was willing to rent their houses to us as everybody feared that they would get damaged by wheel chair marks. Hostels also do not want to admit the disabled. So, we had a tough time finding accommodation for the rural PWD. Commuting is a big problem for all of them." But in spite of the society's callous indifference making their job more difficult, the change in the attitude of the PWD makes the task worth it for the members of the CPDL. Shenoy sums it up when she admits, "They come here listless, dull and unhappy, but go back smiling and cheerful. This is what we want to see on all their faces, a truly magical change."